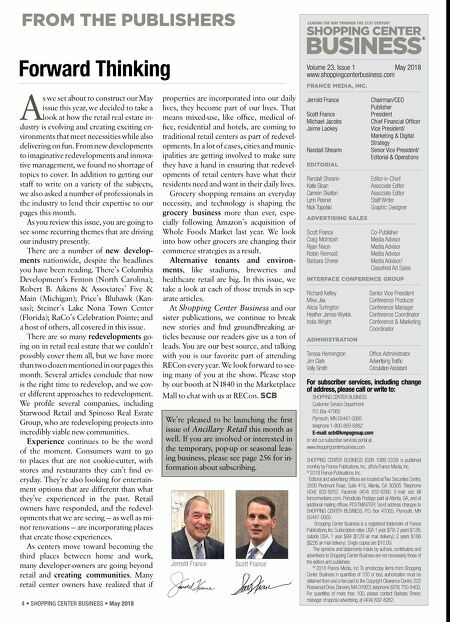 FROM THE PUBLISHERS Volume 23, Issue 1 May 2018 www.shoppingcenterbusiness.com FRANCE MEDIA, INC. Jerrold France Chairman/CEO Publisher Scott France President Michael Jacobs Chief Financial Officer Jaime Lackey Vice President/ Marketing & Digital Strategy Randall Shearin Senior Vice President/ Editorial & Operations EDITORIAL Randall Shearin Editor-in-Chief Katie Sloan Associate Editor Camren Skelton Associate Editor Lynn Peisner Staff Writer Nick Topolski Graphic Designer ADVERTISING SALES Scott France Co-Publisher Craig McIntosh Media Advisor Ryan Nixon Media Advisor Robin Reimold Media Advisor Barbara Sherer Media Advisor/ Classified Ad Sales INTERFACE CONFERENCE GROUP Richard Kelley Senior Vice President Mike Jax Conference Producer Alicia Turlington Conference Manager Heather James-Wyrick Conference Coordinator India Wright Conference & Marketing Coordinator ADMINISTRATION Teresa Hennington Office Administrator Jim Clark Advertising Traffic Vally Smith Circulation Assistant For subscriber services, including change of address, please call or write to: SHOPPING CENTER BUSINESS Customer Service Department P.O. Box 47065 Plymouth, MN 55447-0065 telephone 1-800-869-6882 E-mail: scb@kmpsgroup.com or visit our subscriber services portal at: www.shoppingcenterbusiness.com SHOPPING CENTER BUSINESS (ISSN 1088-3339) is published monthly by France Publications, Inc., d/b/a France Media, Inc. © 2018 France Publications, Inc. Editorial and advertising offices are located at Two Securities Centre, 3500 Piedmont Road, Suite 415, Atlanta, GA 30305. Telephone (404) 832-8262. Facsimile (404) 832-8260. E-mail: scb @ francemediainc.com. Periodicals Postage paid at Atlanta, GA, and at additional mailing offices. POSTMASTER: Send address changes to SHOPPING CENTER BUSINESS, P.O. Box 47065, Plymouth, MN 55447-0065. Shopping Center Business is a registered trademark of France Publications, Inc. Subscription rates: USA 1 year, $79; 2 years $126; outside USA, 1 year $99 ($129 air mail delivery); 2 years $166 ($226 air mail delivery). Single copies are $10.00. The opinions and statements made by authors, contributors and advertisers to Shopping Center Business are not necessarily those of the editors and publishers. © 2018 France Media, Inc. To photocopy items from Shopping Center Business in quantities of 100 or less, authorization must be obtained from and a fee paid to the Copyright Clearance Center, 222 Rosewood Drive, Danvers, MA 01923, telephone (978) 750-8400. For quantities of more than 100, please contact Barbara Sherer, manager of special advertising, at (404) 832-8262. 4 • SHOPPING CENTER BUSINESS • May 2018 A s we set about to construct our May issue this year, we decided to take a look at how the retail real estate in- dustry is evolving and creating exciting en- vironments that meet necessities while also delivering on fun. From new developments to imaginative redevelopments and innova- tive management, we found no shortage of topics to cover. In addition to getting our staff to write on a variety of the subjects, we also asked a number of professionals in the industry to lend their expertise to our pages this month. As you review this issue, you are going to see some recurring themes that are driving our industry presently. There are a number of new develop- ments nationwide, despite the headlines you have been reading. There's Columbia Development's Fenton (North Carolina); Robert B. Aikens & Associates' Five & Main (Michigan); Price's Bluhawk (Kan- sas); Steiner's Lake Nona Town Center (Florida); RaCo's Celebration Pointe; and a host of others, all covered in this issue. There are so many redevelopments go- ing on in retail real estate that we couldn't possibly cover them all, but we have more than two dozen mentioned in our pages this month. Several articles conclude that now is the right time to redevelop, and we cov- er different approaches to redevelopment. We profile several companies, including Starwood Retail and Spinoso Real Estate Group, who are redeveloping projects into incredibly viable new communities. Experience continues to be the word of the moment. Consumers want to go to places that are not cookie-cutter, with stores and restaurants they can't find ev- eryday. They're also looking for entertain- ment options that are different than what they've experienced in the past. Retail owners have responded, and the redevel- opments that we are seeing — as well as mi- nor renovations — are incorporating places that create those experiences. As centers move toward becoming the third places between home and work, many developer-owners are going beyond retail and creating communities. Many retail center owners have realized that if properties are incorporated into our daily lives, they become part of our lives. 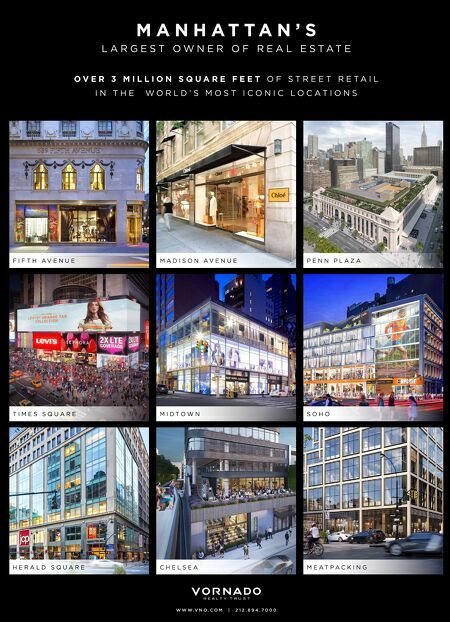 That means mixed-use, like office, medical of- fice, residential and hotels, are coming to traditional retail centers as part of redevel- opments. In a lot of cases, cities and munic- ipalities are getting involved to make sure they have a hand in ensuring that redevel- opments of retail centers have what their residents need and want in their daily lives. Grocery shopping remains an everyday necessity, and technology is shaping the grocery business more than ever, espe- cially following Amazon's acquisition of Whole Foods Market last year. We look into how other grocers are changing their commerce strategies as a result. Alternative tenants and environ- ments, like stadiums, breweries and healthcare retail are big. In this issue, we take a look at each of those trends in sep- arate articles. At Shopping Center Business and our sister publications, we continue to break new stories and find groundbreaking ar- ticles because our readers give us a ton of leads. You are our best source, and talking with you is our favorite part of attending RECon every year. We look forward to see- ing many of you at the show. Please stop by our booth at N1840 in the Marketplace Mall to chat with us at RECon. SCB ® Forward Thinking Scott France Jerrold France We're pleased to be launching the first issue of Ancillary Retail this month as well. If you are involved or interested in the temporary, pop-up or seasonal leas- ing business, please see page 256 for in- formation about subscribing.